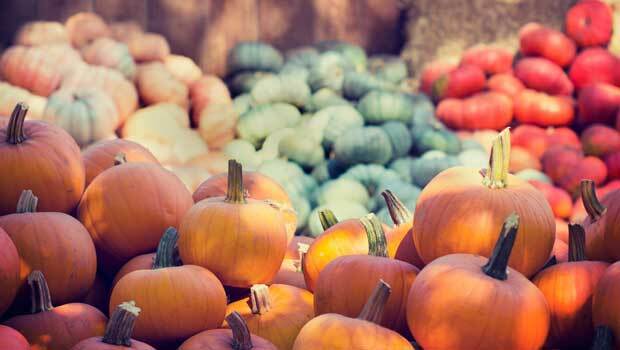 Pumpkins aren't just for Halloween; they're for Thanksgiving pies! Americans celebrate Thanksgiving on the fourth Thursday of November. While the holiday has religious and controversial roots, today, Thanksgiving is celebrated as a secular holiday. Families and friends come together for a traditional meal that usually includes some, if not all of the following dishes: turkey, cranberry sauce, stuffing, mashed potatoes, candied yams, and pumpkin pie. Each family has its own Thanksgiving traditions, often representative of their cultural and/or ethnic background. Americans are proud of the fact that we can all celebrate the same holiday, albeit in different ways! This parade cannot be missed! It is the oldest parade in the U.S., dating back to 1924. You may have seen it on TV, but why not get a cup of coffee and go early Thanksgiving morning to see the dancers, musicians, and gigantic balloons! American football on Thanksgiving Day has been a tradition since 1920. You can enjoy not one, not two, but three American football games, around the country. Why not see a historical reenactment of the "First Thanksgiving"? You'l find handmade souvenirs to bring home to your family and friends! Turkey Trots are a fun nickname for races that take place on Thanksgiving Day. Many people in the U.S. love running these races as a way to not feel guilty about eating so much for Thanksgiving Dinner! The Friday after Thanksgiving is considered to be one of the busiest shopping days of the year, as most retailers provide some sort of a sale or special deal. Why not visit the Mall of America – the largest shopping mall in America in Bloomington, Minnestota?